Is LottoDeal a Scam or Legit? Read Reviews! LottoDeal Exposed — Are Their Syndicate Packages Really the Deal of the Century? Initially LottoDeal.com looks like it offers some pretty good syndicates in packages for a bunch of international lotteries. Players buy in for a month for each package. But how good are their syndicates and is LottoDeal.com the place for that deal! These folks offer five packaged syndicates combinations: Australian, Canadian, European, Irish and World Wide. Each has shares of either 100 or 200 and has different combinations of types of tickets. LottoDeal’s Aussie Package has 100 Aussie Powerball tickets per month (20 per game), 195 OZ Australia tickets each month (39 per game), 596 EuroMillions tickets per month and 234 US Powerball tickets per month (26 tickets per game). Where there is a lucky star included they use the main ticket lines and then all the lucky star combinations. The Canadian package includes 1,152 tickets for Lotto 649 and 596 EuroMillion tickets. What is weird is the tickets for Lotto 6/49 has two syndicate groups. One of them chooses picks five main numbers and then changes the sixth number to reflect all combinations (396 tickets). The second syndicate uses some magic mathematical formula that picks 9 numbers and then runs a bunch of combinations for 84 tickets (756 tickets). Oh, and 234 tickets for US Powerball per month. LottoDeal.com’s European Package is a little different. Each share gets 9 “personal tickets” and 596 syndicate tickets each month. Players also buy into a syndicate for the annual Spanish lottery Navidad that has a total of 300 shares/members though no word on how many ticket lines. LottoDeal.com offers in the Irish Package 252 Irish Lottery tickets (28 per game) 596 Euro Million tickets and 234 US Powerball tickets (26 per game) each month. LottoDeal’s World Wide Package has 596 EuroMillions, 1,152 Canada’s Lotto 6/49, 84 National Lottery of Ireland, 234 US Powerball, 100 Australia Powerball and 195 OZ Lotto tickets. The numbers look pretty big for a syndicate until you break it down by game. Players can withdraw their money from LottoDeal.com by simply clicking on the “withdrawal request” though it will take 7 business days to process and then another 7 days to get to your bank account or credit card. There doesn’t seem to be a minimum withdrawal amount and they don’t mention whether there are charges involved. 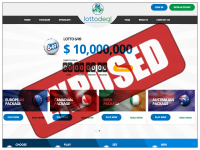 LottoDeal.com takes 10% commission on all winnings. LottoDeal looks like it is operated by Point Call Centers Services Ltd., a company that operates out of Bulgaria with their customer service in Scotland, both with published snail mail addresses. There is also an email address and online form (they answer back in about 48 hours). Add to this telephone numbers for the Australia, Bulgaria, Canada, Ireland, and the UK. The weird thing is call any of them at any time (including business hours) and it goes to a message that says they are not available right now, leave your name and phone number and they’ll call you back – and it’s the same recording everywhere. Would you mind rating LottoDeal.com? Doing the math, the actual ticket lines in each syndicate add up to 5 weeks of tickets versus the month they say. Not sure how that works. The other thing, in each lottery, they talk about an algorithm that helps choose the best tickets, plus use a system of base numbers and then all the lucky stars. You and I both know that winnings based solely on the lucky star aren’t going to go very far shared between 100 or 200 people. Though the syndicates look pretty good we’re giving LottoDeal.com a thumb’s down. As I said before the ticket lines for each syndicate look good by the month, but when you break it down to tickets per game, it’s not that good.